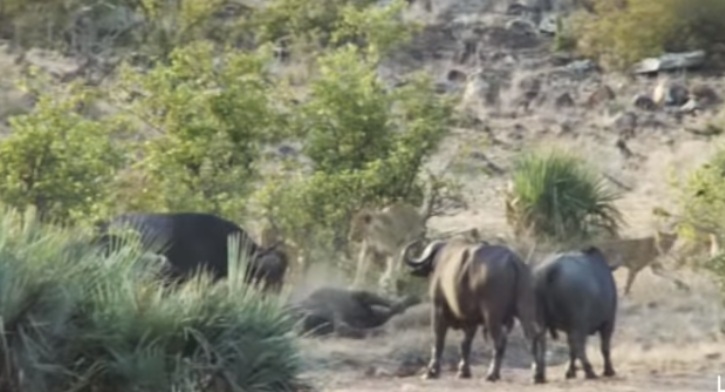 As the author of the video said, the lions set up an ambush at a watering place, where at some point an elephant calf came without its parents. Predators could not miss such a chance, so they immediately attacked him. Hearing a stir, the buffaloes decided to check what was going on there, and then drove the predators away and freed the baby elephant. Even though the elephant calf was free, running away to its parents, later the lions attacked him again. According to him, the elephants could not protect the baby, and this time the predators got their own.